I was born in Durban, South Africa in 1970. My family moved to the country when I was three years old, and as a youngster I developed a deep love for the outdoors, spending my days out fishing, hiking and camping. After high school in Pietermaritzburg I carried out my military service, qualifying as an Operational Medical Orderly and following on from the army, completed a three year diploma in Tourism before travelling abroad for a year, experiencing “the University of Life”. 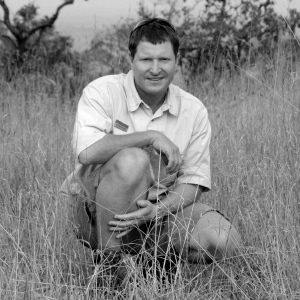 Upon returning to South Africa, I began my dream career as a Field Guide at Londolozi Private Game Reserve before joining Singita Private Game Reserve and staying on for eight extraordinary years. When Singita was awarded one of the prized private concessions in the Kruger National Park, I was chosen to be a member of the team tasked with the pre-opening field and environmental work at Singita Lebombo, located in an untouched corner of the Park. My wife and I then embarked on a thrilling adventure in East Africa when we joined Singita Grumeti Reserves in Tanzania in September 2005 – guiding in the world renowned Serengeti/Mara ecosystem was the experience of a lifetime for me and one that I’ll always cherish. I’ll never forget that first flight over the endless plains of the Serengeti, named for the Maasai word “Siringet” which means the “the land that runs forever” and it couldn’t be more true. I became Head Guide at Grumeti in 2007, managing the department for several years. Since leaving Singita Grumeti in 2011 to settle in Durban, South Africa, I have returned to Tanzania every year since then to share my love and knowledge of the bush by training new guides via in house skills development courses and to consult as a guide at the Singita lodges. I have undertaken numerous privately guided safaris in Tanzania, Botswana, Kenya, Zambia and Botswana, and continue to design itineraries for visitors to Africa, seeking the ultimate safari experience. I’ve been fortunate to travel to many parts of the world over the last 20 years including Europe, the USA, the Middle East, south East Asia, Australia, New Zealand and a number of African countries. I am a dedicated sports fan and keen wildlife photographer. I’m deeply committed to conservation and the bush and have a genuine desire to share this passion with visitors to Africa. I know how to create truly memorable safari experiences and I hope to have the opportunity to do this for you.